James Bowers (inset) is accused of barging into a home on Bridge Street in Willimantic Tuesday afternoon and showing the resident a gun tucked into his waistband. A Groton man was arrested in Willimantic after barging into a home on Bridge Street showing off a realistic looking BB gun, according to Willimantic police. James Bowers, 53, faces charges of home invasion, third-degree burglary, carrying a dangerous weapon and breach of peace. 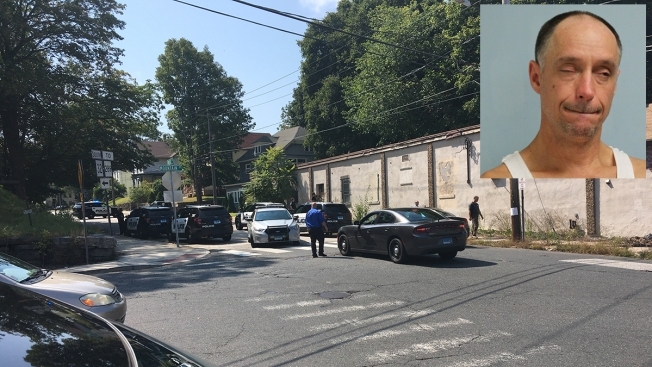 According to police, on Tuesday afternoon Bowers confronted a resident at 85 Bridge Street as the resident opened the front door. The victim told police that when he opened the door, Bowers lifted his shirt and showed a handgun tucked into his waistband. The victim fled and Bowers entered the home, police said. The victim was not injured. Police said the victim had recently moved in and the incident appears to be random. Officers arrived and took Bowers into custody. The handgun was actually a BB gun, police said. Police said that Bowers is a convicted felon with multiple previous arrests. He was issued a $50,000 bond and is scheduled to appear in court Wednesday.